After raking the leaves, I was ready to hang up my rake, and start some fall baking. Something with pumpkin. My daughter walked into our home with her friends as I had the pumpkin pound cake in the oven. One friend said,” Your house smells so good”, the other friend replied, “Your house always smells so good”. What better compliment? So, if you want your home to smell absolutely wonderful, bake this cake, your family and friends will fall in love with you. Again. This is a moist and delicious cake, the cake recipe is from Whipperberry and the Maple Glaze recipe is from Aubrey Cook, a finalist in the “Martha” show “Best Bakers in America” series. Whipperberry didn’t include a recipe for a maple glaze, so I thought Aubrey’s recipe sounded simple and very tasty. It’s a perfect combination of pumpkin and maple. I hope you enjoy it as much as we have. Spray a bundt pan with non-stick spray. Set aside. Stir together the flour, baking soda, cinnamon, nutmeg, and salt. Set aside. Whisk together sugar, oil, eggs, and pumpkin. Fold in the dry ingredients and stir until combined. Pour into pan and bake for 1 hour, or until a toothpick comes out clean. Let cake cool in pan for 15 minutes, then invert to a cooling rack until completely cool. To Prepare the glaze; In a small saucepan, melt butter and syrup together over medium heat. Whisk confectioners' sugar into hot mixture until smooth, and immediately pour over cooled cake. It’s that time of year for pumpkin recipes. That cake looks so delicious and moist. I’m making this today! Thanks for the recipe and inspiration. This sounds absolutely delicious and I am indeed, going to make it today. Thanks so much for sharing all these wonderful recipes. I was hoping not to have to go to the grocery store today but guess what, I have no pumpkin so to the store I go. Got to make this cake! It sounds so yummy. Thank you for this great recipe! Yum! 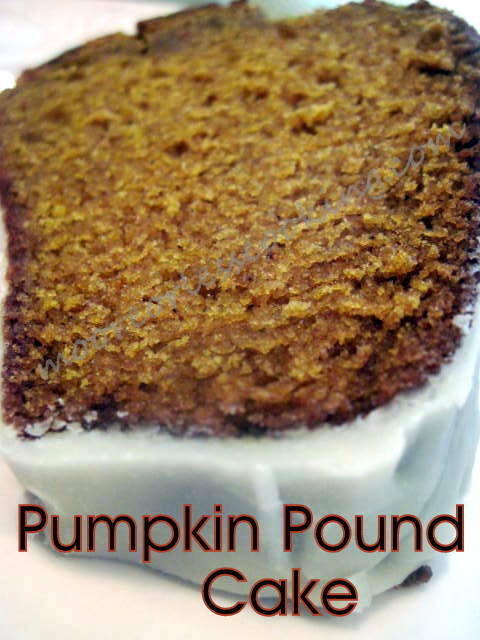 Love Pumpkin Pound Cake and that Maple glaze put it over the top! Thanks so much for linking up to our Spooktacular Halloween Link Party. Can fresh pumpkin puree be substituted for canned? And would there be a reduction in other fluids in the recipe if I did so? You can substitute Pumpkin puree for canned pumpkin in equal measure and your recipe will turn out fine. My other choice would be Caramel. I’ve been looking for a pumpkin pound bread recipe for a while now and I really love your maple glaze twist. Can’t wait to try it! The amount for the Maple Glaze ingredients are missing Nettie, can you please help?